June 13, 1956, A passenger on Piedmont Airlines Flight 5, DC-3C N 45Y, fell to his death through the main cabin door from an altitude of 6,500 feet, near Shelby, North Carolina, at approximately 1807, 1/ June 13, 1956. The crew and other passengers were not involved in the accident. The air stair door received minor damage during the inflight opening and subsequent flight to a normal landing at Asheville, North Carolina. 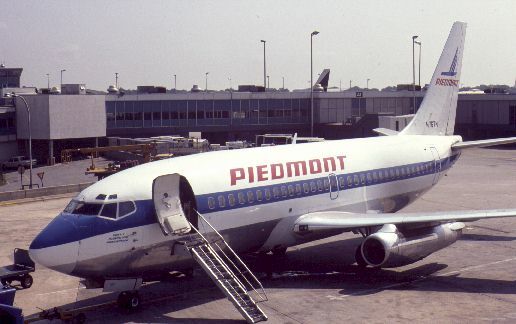 Piedmont Airlines Flight 5 originated at Fayetteville, North Carolina, destination Louisville, Kentucky, with intermediate stops at Charlotte and Asheville, North Carolina, and Tri-Cities, Tennessee. It departed Charlotte at 1744,six minutes late, with Captain Baxter B. Slaughter, Jr., First Officer Henry A. Schulze, Jr., and Purser Bert R. Barnes as crew members, and 24 passengers. Seated in next to the rearmost air of seats on the left side were Mr. and Mrs. Oren A. Pruitt, who had been transferred to Piedmont Flight 5 after arriving at the airport too late to claim their reservations on another carriers flight that departed Charlotte at approximately 1715. The aircraft reached 6,500 feet ms1 cruising altitude at approximately 1806. The seat belt sign had been left on since takeoff because of anticipated turbulence, which had not developed. About one minute later, at 1807, while the purser was on the flight deck obtaining information for a passenger, the aircraft suddenly yawed to the left as the cockpit door-warning light came on. The first officer and purser immediately went to the rear of the cabin where they found the main cabin door fully open. A woman passenger, who was in the lavatory when the door opened, left the lavatory and assisted past the open door by the two crew members. A passenger check revealed that Oren A. Pruitt was missing. The captain circled to establish the location and then proceeded to Asheville, Where a routine landing was made. The flight was canceled at Asheville and the aircraft remained there awaiting inspection. The U.S. Weather Bureau 1728 observation at Charlotte was: Scattered clouds at 25,000 feet, visibility 12 miles.